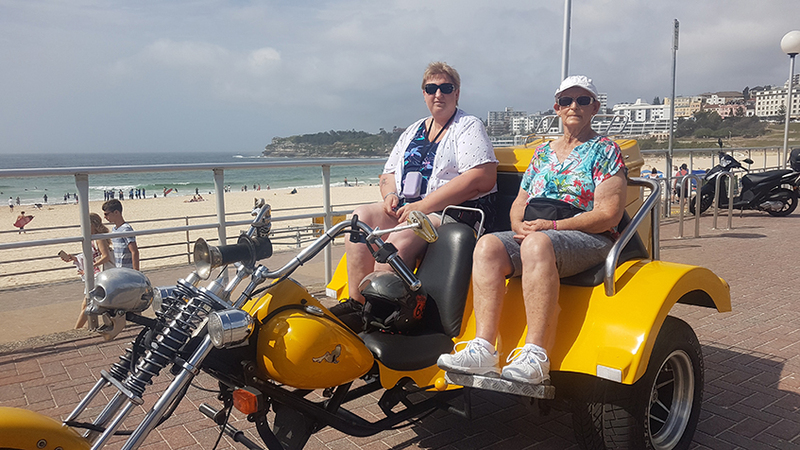 A 14th birthday surprise ride testimonial – Even before the rider (Craig) got back Christine wrote to us: “Thank you for the fabulous Troll Tour with Craig for my Granddaughters birthday. Will recommend this to all.” We love happy customers!! 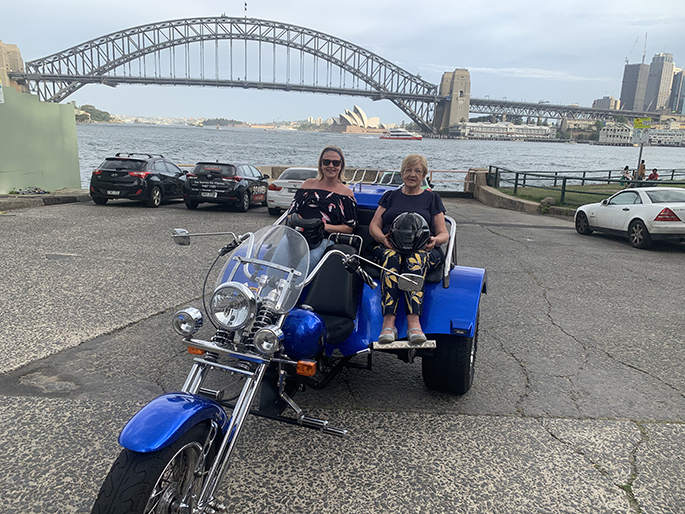 Grandma organised a 14th birthday surprise ride! Sonja just didn’t know what was happening. She sure was happy though. 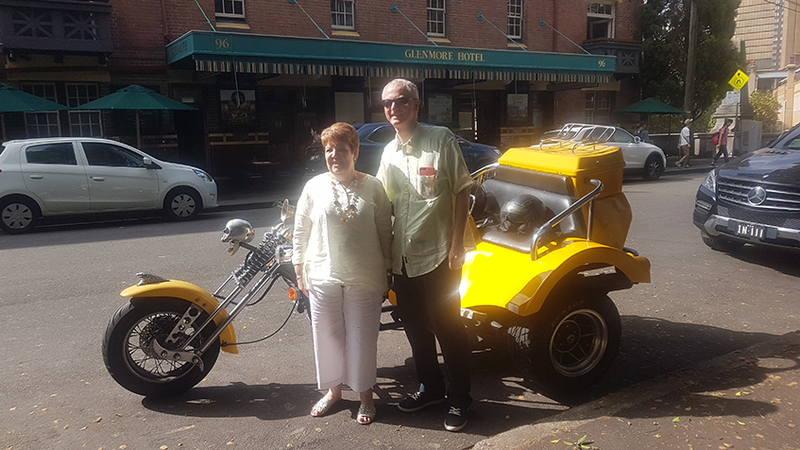 Christine had organised the surprise ride earlier in the week and was so happy we could do what she wanted. Craig picked them both up from grandma’s place. This was in the inner west of Sydney. They did the 3 Bridges ride. The 3 Bridges ride is a good one. Firstly Craig rode them over the Sydney Harbour Bridge. As we have previously mentioned, we love it! It is a wonderful structure to ride over. We love to lift our head up to see the arch in all its glory. We aren’t talking about the riders though, they keep their sight firmly on the road. First stop is Kirribilli. As you can see by the photo this is a great place to look across the harbour. The view really is impressive. The first thing you will see is the Sydney Opera House and the CBD. if you look right you will see a different perspective of the bridge. 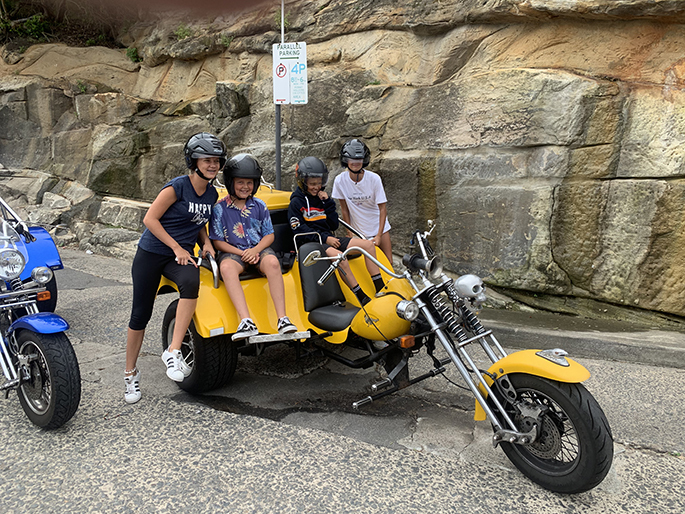 Then they started their adventure again by riding into the lower north shore suburbs. This led them into the inner western suburbs where the record building Gladesville Bridge is. It is the second main bridge on the 3 Bridges ride. The next place they rode to was ANZAC Bridge (a cable-stayed bridge). BUT, there was a detour though. A really good one which always happens on the 3 Bridges ride. The detour was the “Bay Run”. It is a 7km footpath for walkers and pushbike riders which travels around ‘Iron Cove’. This is a very scenic inlet of Sydney Harbour. After the Bay Run they rode over the wonderful ANZAC Bridge and back to home in the inner west. A 14th birthday surprise ride was the perfect present for a teenager! Grandma loved it also. 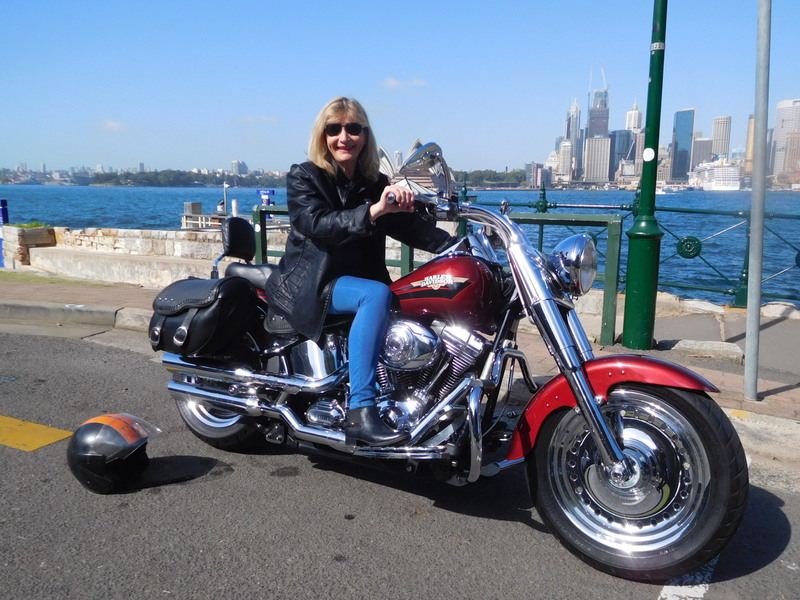 Our wedding anniversary Harley tours are such fun! I have popped the photo and information up on my F.B page for all to see , what a great time we had, thoroughly recommended to all my friends and family. 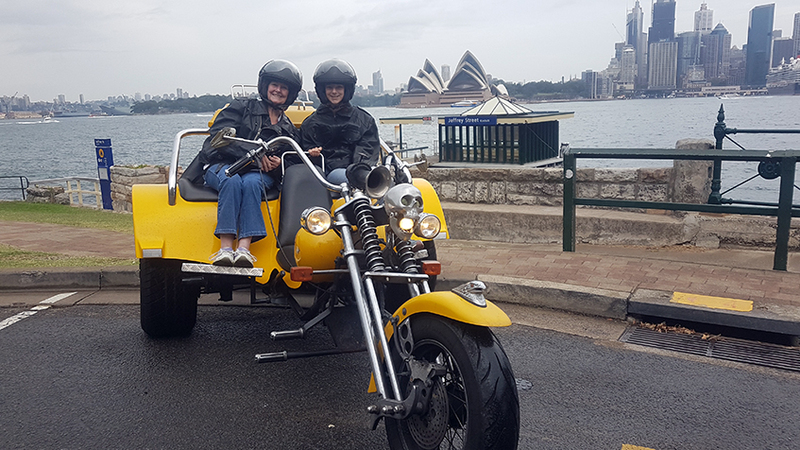 The wedding anniversary Harley tours was a great way to celebrate an important occasion. Kevin was given the Harley ride as a Christmas present. So Julie decided she’d like to do a Harley ride as well. 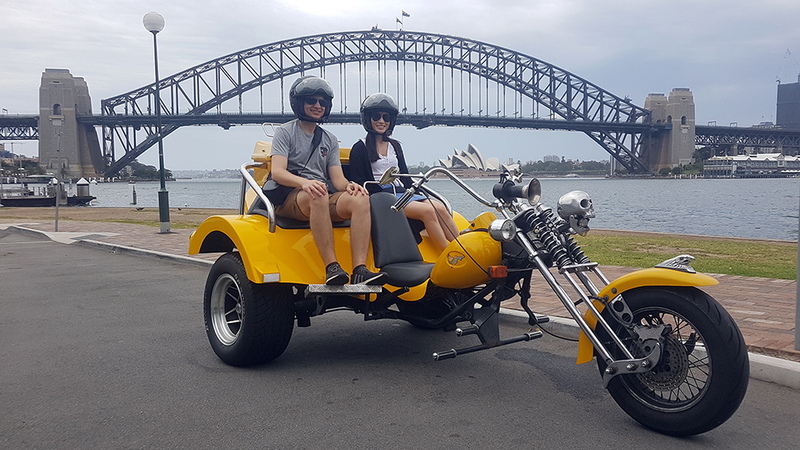 They are from Orange (4 hours west of Sydney) and decided to celebrate their wedding anniversary by doing the Harley ride when they came to Sydney. Phil and Perry picked them up from their hotel and took them on the experience of a lifetime. 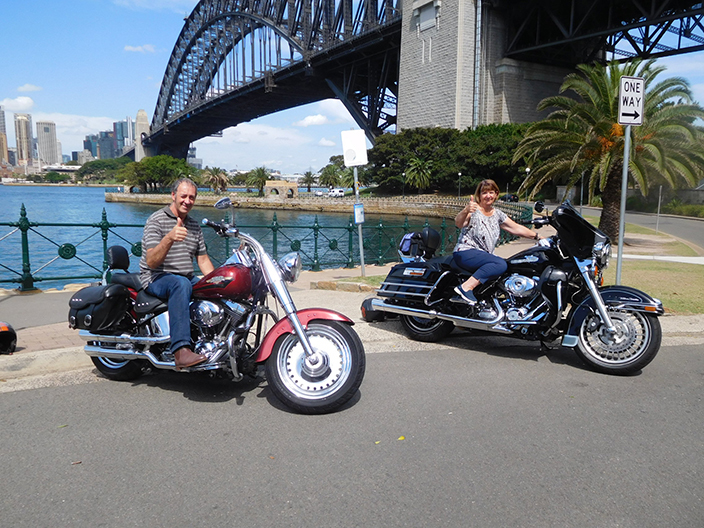 They rode over the famous Sydney Harbour Bridge and did the Kirribilli Loop. The Loop has wonderful views across Sydney Harbour towards the Sydney Opera House and the city. It also takes you under the north end of the Harbour Bridge. Therefore, this will show you a unique aspect of it. They continued into North Sydney for a quick look before heading back over the bridge. Then they rode past the beautiful Royal Botanical Gardens. There is a beautiful view towards the west of the Opera House and the Harbour Bridge. Next they rode past Mrs Macquarie’s Chair, a chair carved out of stone. 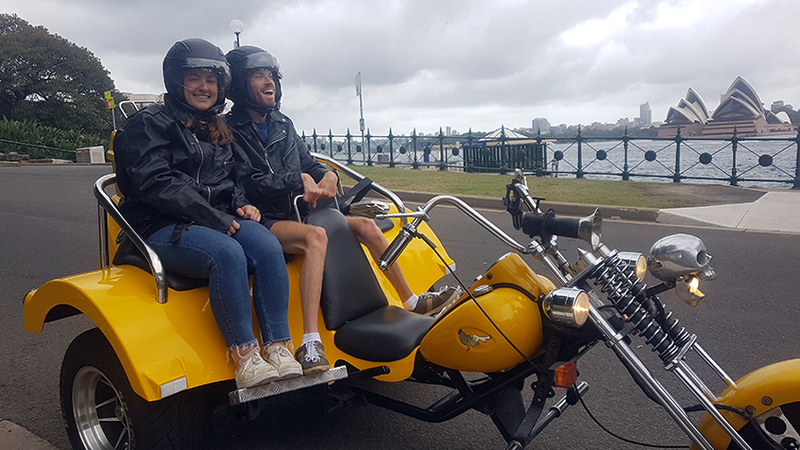 They rode into Woolloomooloo where the iconic and original Harry’s Cafe De Wheels is located. They continued on through the infamous Kings Cross before heading to Circular Quay. So then they could start to explore Sydney on foot and have some lunch. 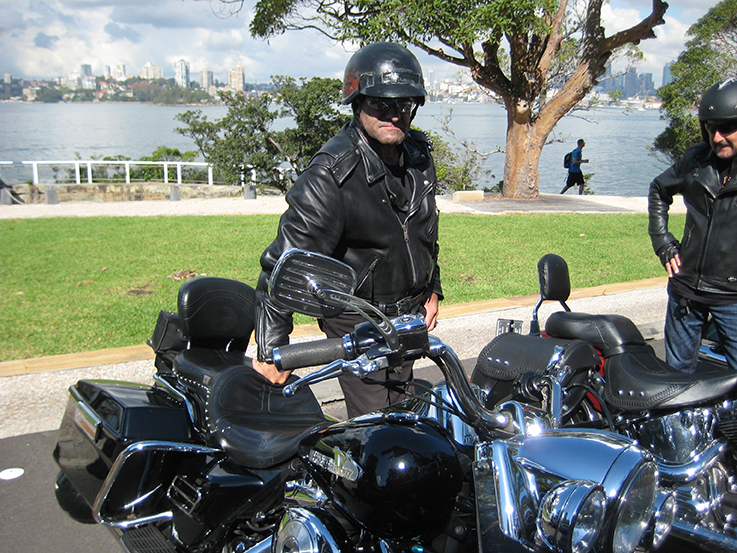 The wedding anniversary Harley tours was a great celebration of an important occasion. An experience they will never forget and one they absolutely loved. Mrs Macquarie’s Chair (also known as Lady Macquarie’s Chair) is an exposed sandstone rock cut into the shape of a bench. It is on a peninsula in Sydney Harbour. It was hand carved by convicts in 1810 for Elizabeth Macquarie. She was the wife of Major-General Lachlan Macquarie, Governor of NSW. 4 teenagers on school holidays – 2 females, 2 males looking for something different. Great vibe, great ride, great Tour Trike Leaders Craig and Steve. Interesting places to see. Easy to recommend to anyone to try and great to give or receive as a birthday or Christmas present. We can design a ride to suit you! Please read some of our reviews on TripAdvisor, link above.